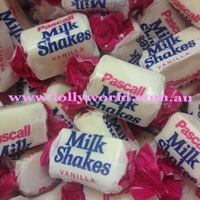 Milk Shakes online and in store at Lollyworld a World of Lollies. Milk Shakes from New Zealand have the best flavour of milk shakes available and I’m an Aussie. The beautifully sweet tasting milky chews come in a 200g bag.